Robert Boytim and Connor Grady, diagnosed with Traumatic Brain Injury and Cerebral Palsy respectively, were left in the hands of fate as the doctors declared that their prognosis was grim and that there was a fair chance that they would die. However, life had other plans for these two kids, who are now living a very different life than what the doctors had warned their parents about. Robert Boytim was an active and happy kid until the day he fell into a pond and nearly drowned. Although he was retrieved from the pond by his sister, and the police along with the emergency medical services performed CPR on Robert for 45 minutes, he was not the same person as before. The near drowning incident led to Robert sustaining a traumatic brain injury, with the doctors saying that his prognosis was gloomy. William Boytim, Robert’s father said that they were sent home with his child and were told by the doctors that Robert would never speak, react, or open his eyes again. On the other hand, there's Amy Grady, who was getting ready to donate her son Connor's organs after he was diagnosed with Cerebral Palsy at birth. Similar to Robert, the doctors also gave no hope for any improvements in Connor's health following his gloomy prognosis. “There were no other options for us. We went home with a baby who was going to die,” said Amy Grady. 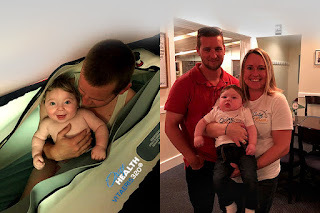 It was at this juncture in their lives that both Robert and Connor's families came into contact with Dr. Paul Harch, who specialized in hyperbaric oxygen therapy or HBOT. For the uninitiated, hyperbaric oxygen therapy uses pure oxygen to accelerate the natural healing process of our body. Dr. Harch, who works at the LSU School of Medicine, explained that an injury, especially the likes of CP and TBI, reduces the flow of blood and oxygen delivery to the damaged tissues and cells. The inadequate amount of oxygen (or the absence of it) can lead to hypoxia and subsequently inflammation. The most effective way to counter these conditions is to increase the flow of oxygen to the damaged and inflamed tissues, which will in turn stimulate the release of growth factors and will also help reduce hypoxia. Both the kids underwent HBOT sessions under the careful supervision of Dr. Harch. When Robert was admitted to the care of Dr. Harch, his body was completely bent backward and his rear was within eight inches to the back of his head. Connor, on the other hand, was non-responsive in his expressions and actions. However, just after one session of HBOT, Robert’s bend was gone and as the treatment continued, he kept getting better and better. Robert can now move his legs and arms, he eats properly, and laughs from time to time. Similarly, Connor, after his first treatment in a hyperbaric chamber given by the International Hyperbaric Association, was physically active and exhibited it by playing on the mat and kicking his legs. This sea change in Connor's health has made his mother Amy hopeful for his future and she can now dream that her son will, in future, lead a good and fulfilling life. The IHA has also extended an invitation to Amy Grady to attend the IHA hyperbaric conference to know more about the hyperbaric oxygen therapy. While the U.S. Food and Drug Administration (FDA) is yet to approve the usage of hyperbaric oxygen therapy for TBI and CP, it is increasingly being used by doctors all over the world for the treatment of these conditions. A 2009 research study applied hyperbaric oxygen therapy on 69 patients who had sustained severe TBIs, to demonstrate the positive effects of HBOT on brain injury. The participants were randomly divided into three groups within a day of sustaining the injury. The first group received hyperbaric therapy for an hour at 1.5 ATA. The second group of patients received three hours of normobaric hyperoxia (NBH) treatment, at 1 ATA. The third and final group – the control group – were provided standard care. The treatments of all the three groups of patients continued for three consecutive days, every 24 hours. In the end, it was seen that the patients who received HBOT experienced a positive increase in brain metabolism when compared to the NBH group and the control group. Another groundbreaking hyperbaric study, conducted by Dr. Harch and his group, involving 16 US military veterans diagnosed with Post-Traumatic Stress Disorder (PTSD) and TBI, produced similar results. The 2011 study demonstrated that it was safe to treat such cases with HBOT at 1.5 ATA in order to counter the debilitating effects of TBI and PTSD. Similar results have been documented about the application of hyperbaric oxygen therapy for the treatment of cerebral palsy. Theresa Washington's son Andrew was also born with cerebral palsy. Washington opted for hyperbaric oxygen therapy for the treatment of her son, and Andrew underwent HBOT sessions daily for a period of six months. Prior to the treatment, Andrew had uncontrolled movements and weak limbs, and his head lolled back and forth with no control on his part. “Andrew’s body was curved like a banana. He had no control over any of his muscles and was being fed through a tube. He was on 16 different kinds of medication,” said Theresa. Theresa opted for HBOT after a surgery was conducted on Andrew to resolve an issue with one of his testicles. Subsequent to the surgery, Andrew’s condition worsened and Theresa was advised to opt for hyperbaric oxygen therapy as a last attempt to save her child. However, after eight years of hyperbaric sessions, Andrew is like a new person. His understanding has improved vastly, along with his eyesight. He can now do math, read, and can also tell the time. He has also gained considerable control over the muscles of his limbs and can squeeze a ball. While hyperbaric oxygen therapy is a novel treatment method that is yet to be considered as a traditional treatment option for cerebral palsy and traumatic brain injury, it is increasingly being used all over the world to counter these conditions. As a matter of fact, the International Hyperbaric Association (IHA) is conducting an open-to-all hyperbaric conference, that can be attended by both physicians and private individuals who want to know more about this treatment procedure. The conference will be held from January 3 to January 7, 2019, onboard a cruise ship. In case you are interested to attend the conference, click here to register.